Victor Edward Petschel was born 20 August 1918 Dimboola, Western Victoria and grew up on the family farm, ‘Rosenhugel’ at Wail, which is still held by the Petschel family. His parents were Christian Bernhard Petschel (1872 – 1946) and Minna Louise Holtkamp (1878 – 1938). Edward Petschel began his education at Wail State School in 1924 and later attended Immanuel College, North Adelaide from 1933 – 1935. Two subjects he had difficulty with were Latin and Greek. Reports in The Echo reveal he was included in Football and Cricket teams and had the nickname of “Vep”. The Echo reported that as a cricketer he was a “valuable fieldsman”, and in football “handles the ball cleanly and with certainty”. After leaving Immanuel, Edward returned to the family farm until joining the Army in January 1940, just a few months after the outbreak of war. He was posted to Adelaide River in the Northern Territory, serving in the 19th Machine Gun Battalion for two years. He applied to enlist in the RAAF at Noonamah, Northern Territory, 3 December 1942. Edward joined the Royal Australian Air Force 31 March 1943 at the No 1 Receiving Centre Melbourne and was allotted the Service Number . 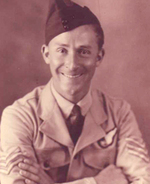 Training began at No 1/ITS (Initial Training School), Somers, Victoria and on 24 April 1943 after 3 weeks he was categorized as a WAG (Wireless Air Gunner). Edward married Verna Clara Helen Schultz at Dimboola, 17 July 1943. Her father was Pastor Wilhelm Johann Georg Schultz. Verna was duly noted as Edward’s next of kin, and her address was Nhill. Next was 1/WAGS (Wireless and Gunnery School) at Ballarat, 22 July 1943, where he learnt the wireless/radio side of things. Following that was the gunnery component of his course, beginning 18 October 1943 at 3/BAGS (Bombing and Gunnery School) Sale, flying in Fairey Battles and Airspeed Oxford aircraft. Here he gained his Air Gunner’s Badge, 11 November 1943. From here he went to No 2 Embarkation Depot, Sydney, NSW and embarked for overseas service, 26 November 1943. Upon arrival in the United Kingdom, 10 January 1944, Edward was sent to 11/PDRC (Personnel Dispatch and Reception Centre) at Brighton, which was the receiving station for RAAF aircrew. Being an air gunner meant he didn’t languish here too long and on 15 February 1944 was sent to 18/OTU (Operational Training Unit) and later 27/OTU, Litchfield, where he would have met the rest of his crew and trained in Wellington twin engined bombers. As they were destined to fly four engine aircraft, the crew was sent to 51 Conversion Base, 7 June 1944, to be first familiarized with the Short Stirling and then graduate to the Avro Lancaster. On 17 August 1944 he was posted to 97 Squadron RAF as a mid-upper gunner. 97 Squadron Royal Air Force, whose motto was “Achieve Your Aim”, had previously become a Pathfinder Force Squadron in April 1943, which duties consisted of accurately marking the target for the following bomber stream and it was attached to No 5 Group, RAF Coningsby from 18 April 1944. One would assume it would have followed on such duties here and become part of the 5 Group Marker Force. On the night 20 – 21 March 1945 No 5 Group, Bomber Command, sent a force of 224 Lancaster and 11 Mosquito aircraft to attack the synthetic oil plant at Bohlen, south of Leipzig, Saxony. Reports of that night indicate the weather was clear and visibility good. Flak (anti-aircraft fire) in the target area was moderate to intense. The attack was successful as the plant was put out of action and it was still that way when captured by American troops several weeks later. Nine Lancasters were reported lost. Following post war investigations, with no trace of the aircraft or crew being found, it was recorded in 1949 that Edward and his crew were officially listed as presumed dead and had no known grave. Other crew members were: John Dennis Cottman, pilot; Aubrey George Murray, navigator; Harold James Arney, wireless operator; John Stewart Coster, bomb aimer; Lawrence Joseph Bull, rear gunner; John William Cross, flight engineer. All the crew were Australian except for Cross. This crew also appears to have flown 20 missions with 97 Squadron and 2 with 106 Squadron. An operational tour for Bomber Command consisted of finishing 30 such missions. Edward served in the Army and Air Force for almost the duration of the war, and at the time of his death was just 27 years old, leaving behind his young wife, Verna. Flight Sergeant Victor Edward Petschel  is commemorated on Panel 284, Runnymede Memorial, United Kingdom, for aircrew lost in that theatre of war and have no known grave. He is also named on Panel 128, Commemorative Courtyard, Australian War Memorial and the Roll of Honour at Dimboola.